Visit Our Store for More Great Items. 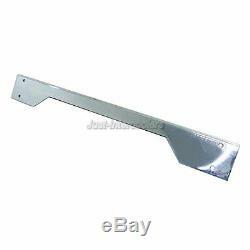 Front Mount Intercooler Bracket & Front Bumper Support Bar For. 02, 03, 04, 05 WRX STi GDA GDB GDF. STi has tight Space, to mount a FMIC, Bumper support normally will need to be removed, and installing a FMIC is difficult. This bracket is made with Thick Aluminum plate, very strong. It can mount almost any intercooler. It bolts onto the chassis bumper bolts, fits perfectly. It not only makes installing FMIC easier, but also enforce the strength of the chassis and improve protection. Our New Products are developed in the US on our own race cars, fully Tested with fitment and Performance. All Race Cars Below Use CXRACING Products. We sell most of our products internationally. PR, Guam, VI , AK, APO , HI. The item "Front Mount Intercooler Bumper Support Bar For 02 03 04 05 WRX STi GDA GDB GDF" is in sale since Tuesday, May 19, 2009. This item is in the category "eBay Motors\Parts & Accessories\Car & Truck Parts\Engines & Components\Belts, Pulleys & Brackets". The seller is "just-intercoolers" and is located in Hacienda Heights, California. This item can be shipped worldwide.